Virginia Pan, summer intern for the Marine Physical Laboratory at Scripps Oceanography, testing the prototype for her lab. 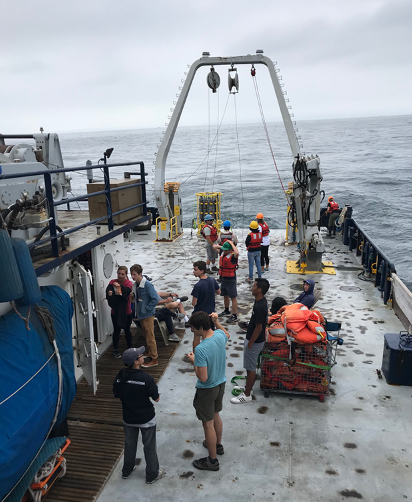 Just 50 feet from the beach, members of the next generation of scientists are using their summers to conduct research at Scripps Institution of Oceanography at UC San Diego. 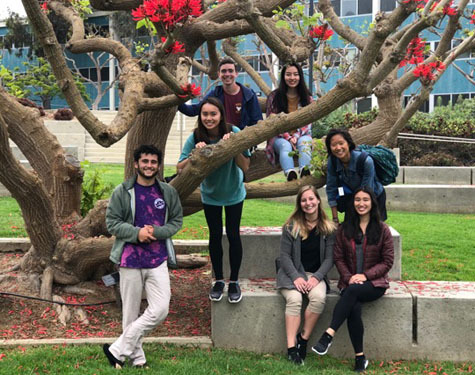 Since 2005, undergraduate students from universities across the United States come together in La Jolla, Calif. every summer for a ten-week research-driven internship program coordinated by the Marine Physical Laboratory (MPL) at Scripps. MPL specializes in multidisciplinary research of ocean sciences and technology, centered around four main research themes: ocean acoustics, physical oceanography, ocean optics, and marine mammal bioacoustics. This year, MPL welcomed 16 undergraduates to the program. Once admitted, each student was paired with a principal investigator (PI) with whom they spent ten weeks working in the lab. In addition to working with their PI, the interns connected with graduate students and other Scripps faculty members throughout their experience through weekly seminars and office hours. MPL interns conducted research in a lab five days a week and earned stipends–but when the clock struck 5 p.m. each day, it only took a few minutes for the interns to make their way to the beach for some relaxation. With flexible starting dates, some interns only overlapped for a few weeks, and yet the group was still close–hanging out after work and on the weekends, some working in the lab together. Here is what just a few of the students had to say about their experience as a 2018 MPL summer intern. For Jensen DeGrande, the MPL internship program exceeded her expectations by showing her how to apply for grad school, implement research methods firsthand, and forge unique connections with her peers. DeGrande, a geographic information science and geomatics major at Texas A&M University in Corpus Christi, participated in research under Scripps geophysicist David Chadwell. As a rising senior, DeGrande knew that graduate school would be the next stepping stone in her science career. When DeGrande was not working, she enjoyed going to the beach, watching the surfers, and exploring the city with other interns. “It was enlightening working with the other interns because we all come from different places in the United States and yet we came together and shared our knowledge with one another,” she said. Alex Gonzalez, a rising senior at Oregon State University, reflected on his time in the MPL internship program with gratitude. 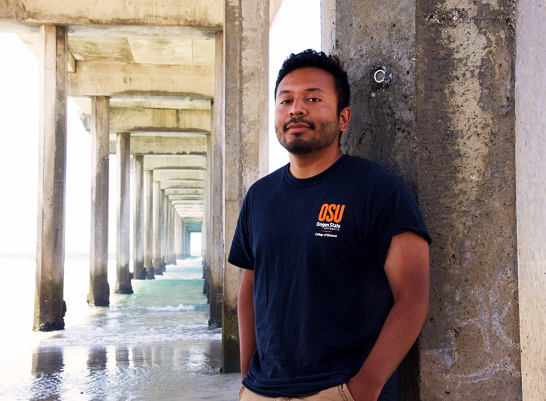 “I’ve learned a whole new field of science,” said Gonzalez, a physics and math major who spent most of his time at Scripps learning signal processing and ocean acoustics under PI Bill Hodgkiss. In the Hodgkiss Lab, Gonzalez learned about match field processing (MFP), a method used to track and locate sources in shallow water. Gonzalez’s project this summer was to solve an inversion problem by knowing certain parameters of a system to determine other physical properties of a specific environment. Back at Oregon State, Gonzalez conducts research in high energy physics. “Having this opportunity to explore ocean acoustics opens me to a new set of problems and problem-solving techniques that allow me to grow as a scientist,” he said. Gonzalez said completing this program means a lot to him because it’s the end of the best summer he has had so far. 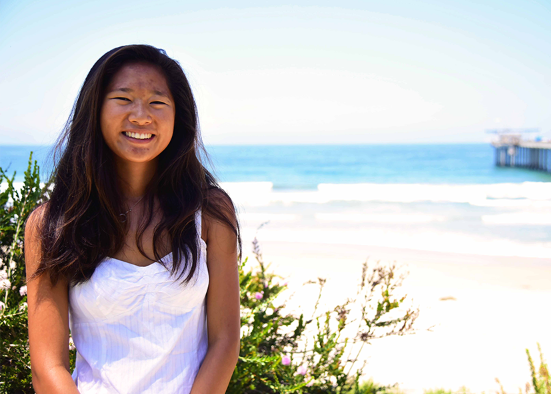 Virginia Pan, a rising junior at Duke University, knew she wanted to spend her summer at Scripps in the MPL internship program. After hearing about the opportunity from a previous MPL summer intern and close friend, Pan was attracted to MPL because it offered an engineering perspective to oceanography. 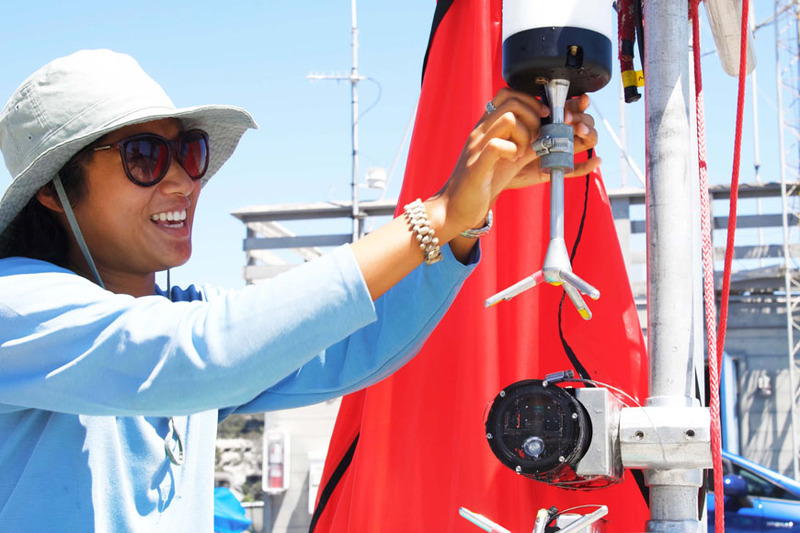 As an electrical and computing engineer major at Duke pursuing a certificate in marine science, Pan said the mission of the Jaffe Lab aligned with her scientific interests. 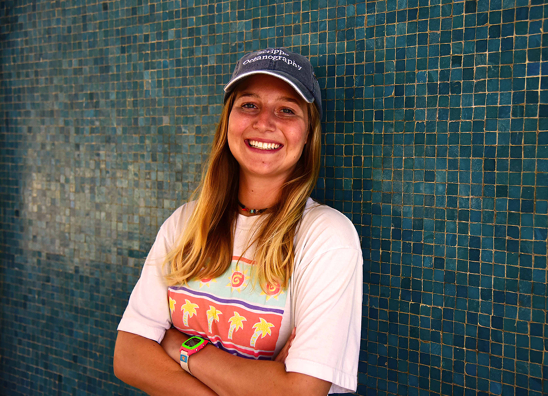 “I applied to a couple research programs, including the Scripps’ SURF program, but this was my top choice because of the opportunities to have Jules Jaffe as my PI and work in this location,” Pan said. In the Jaffe Lab, Pan contributed towards the overall mission of the lab’s research. Throughout her research here, Pan used a lot of equipment on the consumer market. The goal of the project, she said, is to create a low-cost camera for underwater imaging that can be used to measure water velocity. Achieving this goal would be beneficial, Pan explained, because by making these products cheaper, researchers can mount multiple cameras in one area, like a reef, for a better overview of what is going on in that marine environment. With two more years of undergraduate schooling, Pan has not yet decided on graduate school. Pan recognizes that this program was formative in the planning of her remaining years at Duke and it helped her decide that she wants to learn more about signal processing. Learn more about the MPL Summer Internship Program. Applications for the 2019 program will be available starting October 2018. Contact mpl-internship@ucsd.edu for more information.